In 1939, with the world on the brink of war, one women faces a future more uncertain than she had ever imagined... Perfect for fans of Katie Flynn and Cathy Sharp. Beth - orphaned as a child, Beth is coming of age and determined to do her bit for the war effort. Caught up in a whirlwind romance, she marries only to become a war widow... and one expecting a baby who will never know his brave father. Can she find happiness again? However dark the times, courage, determination and the power of friendship can overcome the hardships of war. Hetty’s Secret War can be read as a standalone, but you will find it confusing in the beginning. 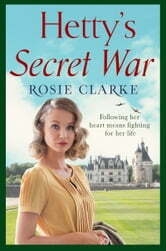 I suggest you read Jessie’s Promise and The Runaway Wife before embarking on Hetty’s Secret War. You will have a better understanding of the characters and their situations. I have always found World War II a fascinating time period (I would not have wanted to experience it though). Women were encouraged to work outside the home and take on tasks that were previously done by men. It was a difficult time, but people rallied together for the war effort. This is what we see in Hetty’s Secret War. I found the story nicely written with a variety of characters in different situations. There is foul language and intimate scenes included in the book (fair warning). While the book focused on Hetty, Beth and Georgie, we also catch up with Annabel. I like how the separate characters stories intertwined to create one charming book. They face losses and experience heartache, but there is joy as well. Hetty experiences danger and life threatening situations. Despite the hardships, they continued to have hope and faith as well as the comfort of family and friends. The ending had me smiling. Hetty’s Secret War is an emotional novel that will touch your heart.